Classical Considerations: Useful Wisdom from Greece and Rome is a collection of Greek and Roman quotations, primarily poetry, accompanied by English translations and brief essays reflecting on their meaning by a variety of modern writers, mostly Americans. Their essays, for the most part, are extremely engaging. These are definitely not dry, detached discourses on the wisdom of the ancients. The art, quotations, translations, essays, and commentaries are arranged according to different themes (Fate, Character, Art, War and Violence, Redemption After Suffering, Time). The book contains several fine original watercolors by Thom Kapheim which provide a colorful and simple introduction to several of the quotations and companion essays. The titles of the paintings are the same as the thematic headings for each chapter. For example, in "Redemption After Suffering," Kapheim depicts a young girl escorted and protected by a fatherly figure, directly paralleling John Breuker's companion piece "Pressing On" which deals with the adversity faced by the father of a disabled child. The translations of the quotations are mostly very literal. For example, non ergo fortuna homines aestimabo sed moribus; sibi quisque dat mores, condicionem casus assignat. 'I will not therefore estimate men according to their fortune but according to their character; each person gives himself his character but chance assigns us our status in life.' Macrobius. The commentaries are provided by various authors. They do not try to be insightful, but rather contextual in their analysis. The commentaries tend to put more emphasis on the relationship of the quotation to the rest of the work, rather than offer any "useful consideration." The book's appendices include brief biographies of the contributors, editors, and the artist. The book is easily read in one sitting. Many of the considerations are intensely personal experiences expressed in such a grief-stricken tone that to critique them in any way might be viewed as inappropriate. In fact, I find much of the text beyond reviewing because it is so very personal. For example, JoAnn Polito's "The Art of Living" recalls the too short life of her brother and the everlasting art of the life he lived. Some readers might be surprised and even a bit overwhelmed by the highly emotive subject matter of many of the essays (e.g., AIDS, infant mortality, drug addiction, mental retardation, parental suicide, infidelity). Timothy F. Winters pens a very instructive piece linking the dangers of rage in Achilles in Homer's Iliad and the distressing rise in violence in the world children inhabit today. Michelle Wu's essay on Seneca's non vitae sed scholae discimus relates how studying the intricacies of Gershwin's "Rhapsody in Blue" gave her an insight into the nature of learning. Her experience recalls an earlier quotation in the book "Music's a great and never failing treasure," a fragment of Theophilus for which no companion essay is provided. Michael Twomey provides a haunting comparison of a Roman proverb inscribed on a prison once used by the Nazis that now serves as his school. Margaret Brucia compares the innumerable kisses of Catullus with the joy she experienced from her many visits to Rome. Robert Sonkowsky effectively links the ferryman Charon's transportation of souls across the River Styx with the Archangel Michael's over the River Jordan. Judi Neri gives her carpe viam perspective in verse form with her delightful poem "I Could Cross the Street." Roger Rosenblatt offers a touching example of Cicero's assertion that character comes not from lineage but rather locality with the touching tale of a Sudanese boy who despite lifelong deprivation shows himself generous to a total stranger, the author himself. The book includes a few quotations which have become so hackneyed that they do not invite or allow much of an interpretive treatment, e.g., tempus fugit, but thirteen year-old Noah Peller nevertheless succeeds in giving one. The back cover blurb boasts "when modern writers reflect on thoughts from ancient counterparts, the result is in-depth perception and a wider vision." That perspective is readily apparent from reading the book. The reader of this book will not necessarily gain an understanding of the attitudes of Greeks and Romans, but rather how the wisdom of the ancients is made useful by the moderns in a variety of ways. For example, several of the pieces are critical of warfare, in particular America's involvement in Vietnam. Some of the pieces have an apologetic tone, with the writers focusing on the horrors of Vietnam and the impact of this chapter of America's history on the conscience of the combatants and their families. William Race shares his fears as an artillery officer in Vietnam as a painful proof of Pindar's "A sweet thing is war to those without experience, but one of those with experience dreads its approach exceedingly in his heart." Jonathan Shay follows with personal accounts of Vietnam veterans whose narratives seem to suggest an Achillean loss of character as a result of the brutalities of war. Other considerations are quite strident in their tone. Robert Meagher turns a quotation from Euripides' Alkestis into a fierce reproach of President Bush. It is interesting to note that in some pieces the views of the essayists are particularly and understandably American, rather than Greco-Roman. Stephanie Quinn's discussion of Sinon's speech in the Aeneid and the challenge confronting citizens in a post-9/11 world to detect deceit is a "useful consideration" which avoids the politically preachy tone of some of the other essays. In an excerpt reprinted from his autobiography, Penn State's football coach Joe Paterno cites Aeneas as an inspiration not only in football, but also in life for facing adversity and for his quest to seek destiny. Alexandra Stevenson responds in verse form to a fragment of a lyric by Praxilla with her own piece "Starry Night." Perhaps the inspiration provided to a modern poet by an ancient verse is the most useful consideration of all. Of the 50 quotations in the text, 29 have companion essays. Because the essays are so personal, and even a bit idiosyncratic, the quotations which were not accompanied by personal essays seemed quite bland. The brief paragraph or two which followed was generally some sort of historical or cultural context for the quotation, and not any reflection upon its utility. I can only surmise that perhaps the intention here is possibly to allow the reader to apply some personal experience to the quotation and construct a meaning to internalize the quotation, but this might be too generous a reading. The editors of this book must have faced difficult decisions as to what citations to include. Certainly there is a wide range of authors and themes available for reflection. It appears that the authors were free to choose their own quotations, resulting in a text with a large segment of the quotations taken from Homer, Vergil, and Horace. Some readers might want to see Aeschylus and Sophocles represented among the Greek authors, as well as Livy and Tacitus in the Romans, but lesser known authors such as Philemon and Macrobius are included here. A few of these axioms may be new even to classicists, e.g., nil adeo subtile, dies quin detegat ultro. In one essay (#19) the inclusion of both a Greek and Roman quotation tends to undermine the beauty and precision of the individual quotation. First the Latin quotation Consuetudinis magna vis est is given, and its meaning, "Great is the force of habit," and the identification of its source, Cicero's Tusculan Disputations." But the facing page has a title of "We are what we repeatedly do" followed by the Aristotle quotation, "Excellence, then is not an act, but a habit" without the Greek text. The "useful consideration" is a paragraph reprinted from Steven Covey's classic "7 Habits if Highly Effective People" which does not make any direct mention of either quotation but rather gives a fairly staid business school definition of "habit as the intersection of knowledge, skill, and desire." When useful becomes pragmatic to the point of being managerial then Covey could be accused of being more Roman than even a Roman. Some of the commentaries yield little "useful." For example, in the commentary on the Latin quotation spina gerit florem, quae gignit tacta dolorem, there is only a brief mention about the limited scientific knowledge of Greeks and Romans. Other quotations [right word?] which do deal with well-known and well-worn classical quotations are left without any meaningful considerations. A prime example is Vergil's O passi graviora, dabit deus his quoque finem. Forsan et haec olim meminisse iuvabit. Only a literal translation and three sentences explaining the context of this quotation in Book 1 of the narrative are given. Surely the editors could find someone to contribute a "useful" consideration for these powerful lines. Those treatments which do not have dramatic and intense personal experiences to relate tend to come off as somewhat mundane treatments of the philosophy of the ancients. The original art in the book incorporates the quotations, not in the form of a separate captions, but actually within the paintings themselves. Some quotations are Greek, some Latin, and one with both the Latin text and a partial English translation. The inclusion of the quotation within the art does not contribute much to the presentation, especially since the complete Latin or Greek quotation is always provided on the page immediately following. In fact, sometimes I found myself propelled too quickly past the artwork, curious to read the complete citation and "consideration," rather than giving the art the attention it merited. Sometimes the accompanying artwork contributes little to the overall effect of the book. In Kapheim's "Art," an image of a loosely drawn classical torso and Greek temple provides a trite pictorial for Horace's ars longa, vita brevis quotation. The book boasts of a "richly diverse" variety of figures offering their views, not just classicists and historians, the majority of those who wrote essays (journalists, playwrights, academic administrators) have certainly spent a considerable portion of their lives safely within the figurative Greek and Latin "moat" which supposedly isolates the ivory tower from the real world. Of course, I realize that it would be difficult to gather deeply contemplative pieces from those whose professions are far a field from such "considerations," but perhaps the diversity of opinions contained here is overstated. Maybe a point of emphasis in the presentation of the text should also be the diversity of Greek and Roman perspectives contained within the classics whose thoughts are being considered. So many of the quotations deal with suffering, loss, and the inevitability of fate, that the reading of many of these pieces gives the impression that the wisdom of classical proverbs is especially suitable as a strategy for coping with personal pain. This sort of utility might leave some readers longing for wider discussions of other notions inherent in Greek and Roman literature and life, such as piety, civic-mindedness, honor, and justice. It is interesting to see in these essays how moderns "usefully" consider their Latin and Greek ancestors in a way which is often very different from the treatment of the classics found in the writings of colonial Americans. Meyer Reinhold extensively documented the fierce debates among early Americans as to the utility of Greek and Roman philosophy and history in the forging of the new republic. But the considerations of many of the classical quotations in this book reveal that usefulness is now measured by what contributes to an individual's ability to survive in a fragmented, frequently unjust society, a view which ironically seems to contrast with the collective sense of civitas that colonials gleaned from their Greek and Latin studies. For the most part these considerations, while not always useful, are certainly forceful. It would seem that Americans today take their classics very personally. I'm not sure if the Greeks and Romans would have "used" literature in this way, but that is not the intent of this collection. Many of these considerations involve episodes in the lives of the authors of such deep suffering that the reader is often overwhelmed by sentiment so strong that the classical quotation referenced seems to fade. As Susan Ford Wiltshire in her piece, "Grace," cautions "Platitudes belittle sorrow." Classical Considerations: Useful Wisdom from Greece and Rome Have no worries. This isn't Chicken Soup for the Modern Soul - Ancient Greece Edition. It's not a self-help book, nor is it a dry, academic read. It's a pithy, sometimes trenchant, collection of quotes and collected wisdoms, which is buoyed by contributions from Penn State coach Joe Paterno (attributing his coaching philosophy to Vergil), Stephan R. Covey (the author of The 7 Habits of Highly Effective People using Aristotle to probe the unconscious) and professor Timothy F. Winters (explaining why reading Homer can help kids learn about softball and life). Editor and Barrington resident Marie Carducci Bolchazy's aim isn't so much to review the wisdom of Greek and Roman literature as it is to show how that ancient wisdom can still prove useful to modern readers. 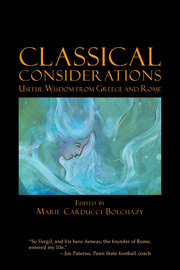 Classic Considerations: Useful Wisdom From Greece And Rome by Marie Carducci Bolchazy is a compendium of reflection on the thought and philosophical vision of the ancients made available in translation and applicable to the circumstances of contemporary readers. Introducing readers to an understanding and compelling glimpse of the core of Western humanities, Classic Considerations consists of wisdom from a psychiatrist who works with Vietnam veterans with post-traumatic stress disorder, a journalist, a famous football coach, a judge, college students, a renowned business and personal development speaker and writer, and a minister for a wide understanding of the interconnecting world of modern philosophy and interpretive study to completely provide an encouraging outlook on life and society. Showcasing the original Greek language quotations, Classic Considerations is very highly recommended to all readers with an interest in Latin or Greek philosophies and their continuing relevance for the present day.